← Hammett: Midget Bandit Week! Yesterday I told you we were going to give you an ID on The Midget Bandit — and here it is. As direct as a fist in the face. If you ever had the slightest curiosity about The Midget Bandit, here are the facts, culled by Warren Harris from the news articles of the day, prison records, and other archives. 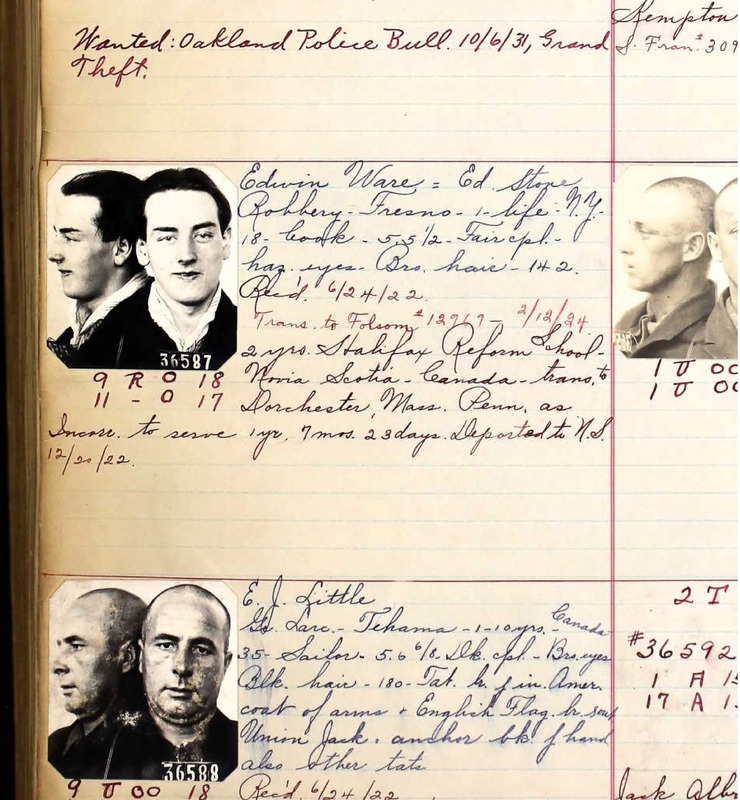 The images at top and bottom of the post — my favorites of the mug shots — come from the San Quentin booking circa June 24 1922. The clip from the Fresno Morning Republican in the text is dated November 21 1921 — at this point, the earliest mug shot of the criminal who inspired Hammett to create Wilmer Cook. For decades Dashiell Hammett scholars have searched in vain for the “The Midget Bandit,” the colorful youth said to be the basis for boy gun-man Wilmer Cook in The Maltese Falcon. Ladies and Gentlemen, meet Edwin Ware. In his introduction to the 1934 Modern Library edition of the novel, Hammett wrote that most of the characters were based on people he met while working as an operative for Pinkerton’s National Detective Agency — most of those people are untraceable at this late date as there are simply too few details to identify them. The original for Wilmer Cook, however, should have been easy to find as Hammett said that the exploits of The Midget Bandit were covered by local newspapers. Stockton, California papers. But Hammett’s only statement on Wilmer’s inspiration gets several key details wrong, leading researchers to look in the wrong place. The tale of Edwin Ware, the 17-year-old holdup man known to local newspapers as The Midget Bandit matches almost exactly to Hammett’s story, save that he was arrested in Fresno rather than in Stockton, California. Both burgs are in California’s Central Valley, only about 127 miles distance from each other. In 1995, columnist Michael Fitzgerald of the Stockton Record spent weeks trying to track down the history of the Midget Bandit. I called Pinkerton. I also called area historians, retired cops, old filling-station owners … every day for weeks, I tried another angle. Finally I recruited a couple of volunteers who slogged through years and years of old newspapers. Joe Schmid found the Miner Bandit, the Gentleman Bandit, the Hermit Bandit, the Boy Bandit, the Argonaut Bandit and the Minstrel Bandit … but no Midget Bandit. Fitzgerald had to give up his quest without finding the trail of The Midget Bandit. Other Hammett scholars have tried and failed to find the bandit in Stockton back issues. The Fresno newspapers in 1921 tell the story of a bandit that matched Hammett’s details almost exactly, with headlines following a hold up at the city’s Central Garage on August 19, 1921 — followed by the robbery of a Standard Oil Company service station on September 1. In the latter robbery — the most important to the legend — Ware followed L. J. Perry home from his job at a Standard Oil station and held him up for day’s receipts, although he gave the man back his own money. Perry called the man who held him up a “little fellow” in newspaper interviews and said he’d like to meet him again. The saga begins on August 19, 1921 — and the legend of Fresno’s Midget Bandit is born. Masked by a black bandana Edwin Ware slipped into the Central garage in Fresno at 3 am. that day, holding up garage man Roy Reid and private patrolman C. A. Murphy, who were talking. Murphy started to go for his gun. Ware took the patrolman’s pistol, grabbed a straw hat and handed it to the men, then pointed to the cash register. With this holdup, a reporter for the Fresno Herald dubs the robber “The Midget Bandit” based on his size. While not a midget, Ware is slight of build and just 5′ 5″ tall. A few days after this incident, police and the press in Fresno connected him to a brutal holdup at the end of August at the Subway Saloon where the proprietor was slugged over the head, but Ware later claimed he was innocent, and he was never prosecuted for the crime. On September 1, 1921, Ware followed L. J. Perry home from his job at a Standard Oil station. Ware had seen the man take the day’s proceeds from the station and held him up at his front door. In contrast to the brash bravado he displayed in the Central Garage holdup, he was described as polite this time. He kept his voice so low that the victim’s mother inside the house thought her son was talking to a friend. Perry told a newspaper that he felt bad that he was held up by a man half as big as he. Ware read the comments and dashed off a reply while waiting for his train to Los Angeles the day after the robbery. “You may tell that big stiff that I may be small but without a gun I can lick any man twice my size,” Ware said. The newspaper was happy to print a facsimile of the robber’s note. While in Los Angeles, he robbed a Standard Oil Station and handed the man a note to give police — identifying himself as the Midget Bandit from Fresno. Later press reports claim he’s a suspect in a series of mail robberies that struck the area in the fall of 1921, including one for more than a half million dollars, but he was never charged over those crimes. He’s reportedly responsible for some 50 gas station hold ups, again without much proof. Ware was also a suspect in the unsolved murder of a gas station manager in Turlock, California. But then, the police claimed a number of people were suspects in that case and the timing makes it doubtful that he would have been involved. A second crime he was responsible for in Los Angeles was the holdup he committed at the Bimini Baths where he supposedly stole $2,000 and engaged in a struggle where he fired three shots. Ware was arrested and sentenced to probation and released without taking credit for the crimes of The Midget Bandit. 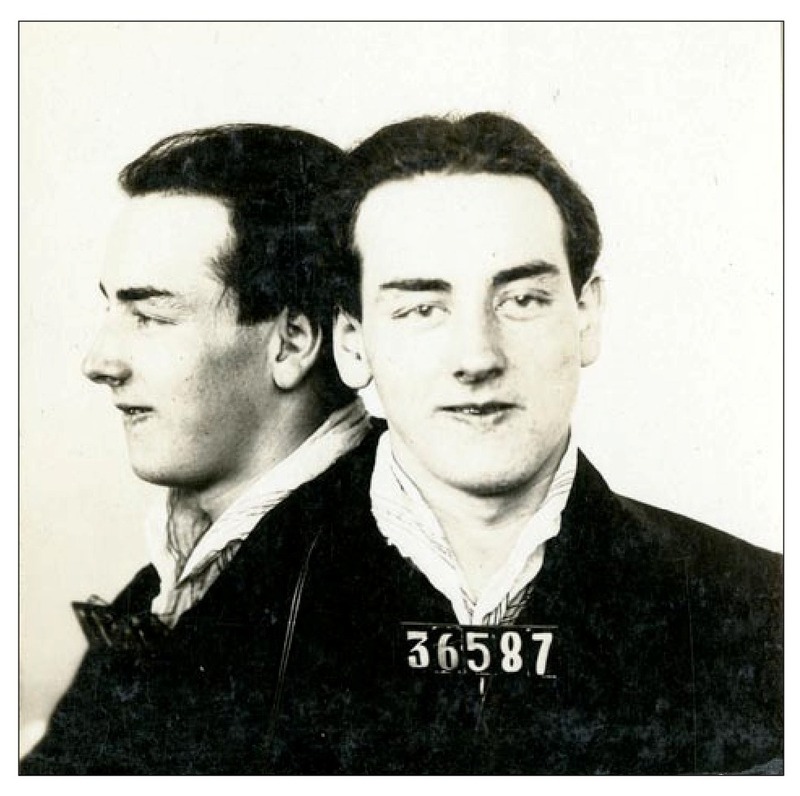 While in the Los Angeles jail, he met fellow 17-year-old John Noble, a Canadian who had done time in his native country. The pair teamed up and committed several crimes. First they robbed a pawnshop on Main Street, obtaining a number of guns. Perhaps feeling that Los Angeles was getting too hot for him, Ware decided to steal a car and return to Fresno and hold up Perry again. Noble went with him. They stopped at the tiny town of Tipton where they burglarized a hardware store and stole silk shirts, pocket knives and a rifle before continuing on to Fresno. Nobel was arrested first on November 20, 1921 when the proprietor of the rooming house where he was staying became suspicious of him. Inspector Tom O’Brien, who had investigated the original Central Garage holdup, confronted Noble, who shoved a gun into the officer’s stomach. O’Brien knocked the gun aside and told Noble that he had him covered with a pistol he had in his coat pocket. Once at police headquarters, Noble confessed that he’s the confederate of The Midget Bandit and that the man they have been looking for was back in Fresno. He told the officers that they shouldn’t try to take The Midget Bandit because he was well armed with several revolvers and thousands of rounds of ammunition. Leading a squad of police officers, Captain B. A. Wickstrom started a hunt of hotels and rooming houses in the city, finding that Ware was in a room at the Hotel Adanis. Ware had intended to hold up Perry again that night, but had fallen asleep instead. At 2:30 Sunday morning, an officer knocked on Ware’s door and called out that Ware had a phone call. The ruse worked and Ware was taken into custody without trouble. Ware then made statements to police and reporters that ends up being much of the evidence against him at his trial, as well as being the origin for the newspaper stories about his life. The brief crime spree of the infamous Midget Bandit, whose exploits were carried by newspapers as far away as New York City, was over. In November of 1921, then, while Hammett was still working for the Pinkerton’s Agency, members of the Fresno City police force arrested 17-year-old Edwin Ware — who confessed to being the man the newspapers dubbed “The Midget Bandit” — along with his confederate, John Noble. As Hammett says, Ware did claim — and really was — just 17-years-old. His father, Harvey Ware, really was a lieutenant with the New York City police department. Unfortunately, Hammett did not have anything to do with Ware’s arrest, although some Hammett biographers have interpreted Hammett’s statement about a “fair pick-up” otherwise. Hammett certainly could have talked to Ware — but he also could have gotten all of the details he relates just from reading newspaper coverage. With police across California trying to pin every unsolved crime in the state onto Ware, it’s possible that the Pinkerton’s Agency, faced with investigating a smash-and-grab jewelry store heist in San Jose, would think it worthwhile to send the then-ailing Hammett to Stockton to interview the jailed Ware to see if they could glue that crime on him as well. But it turns out that Ware wasn’t involved in the San Jose case and all Hammett got for his time was the inspiration for Wilmer. Hammett carefully words his language so that The Midget Bandit was a fair pick-up — he doesn’t say he personally arrested him. He says he went to Stockton (really Fresno, Hammett either got the name of the city wrong when reminiscing fifteen years later — or changed it enough to not credit Edwin Ware directly for inspiration) looking for the criminal who smashed a window at a San Jose jewelry store robbery. He admits that The Midget Bandit wasn’t responsible. Some have read that statement to say that Hammett claimed to have arrested The Midget Bandit while looking for the other criminal. But what Hammett is really saying is that he traveled to Fresno after Edwin Ware was arrested and interviewed him in jail. It was a logical task for a Pinkerton’s agent. Police across the state were trying to tie Ware to every unsolved crime they could. A smash-and-grab at a jewelry store is exactly the sort of crime Ware committed. He’d burglarized a hardware store and robbed a pawn shop in L.A. and he was known to have spent at least some time in the San Francisco Bay Area before moving on to Fresno. Hammett apparently made the trip, met the cocky youth and returned to San Francisco without the lead he’d hoped for — but with the inspiration for Wilmer Cook, the boy gunsel. 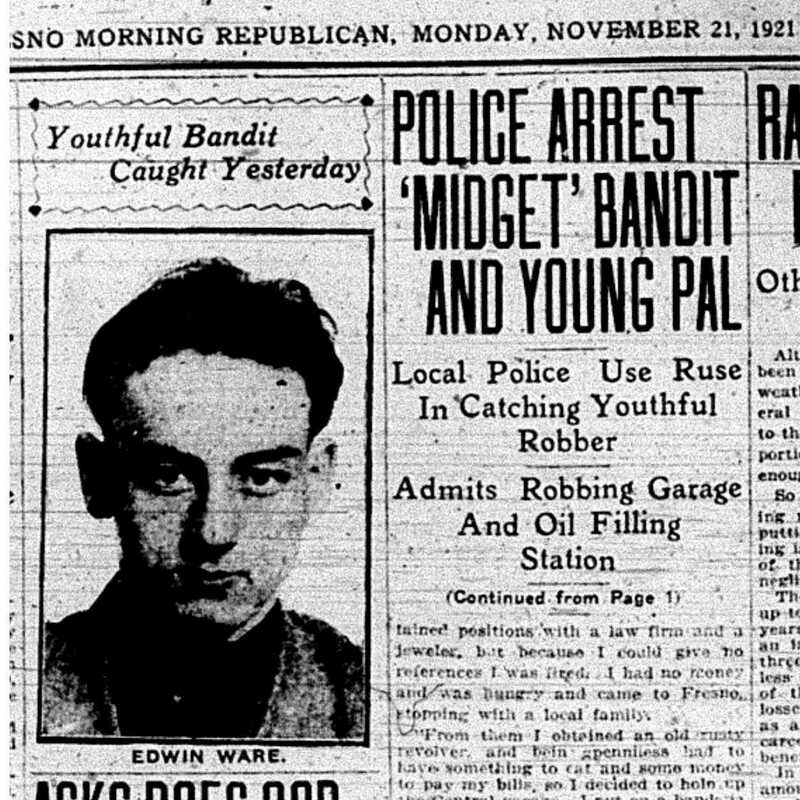 Now that we know the story of the real Midget Bandit, we can say for certain that Hammett, while he might have met the youth, did not have any part in his arrest by Fresno city police officers. Ware was arrested in late 1921 and by early 1922 Hammett was out as a Pinkerton, unable to continue because of ill-health. The trip to interview Ware would be one of Hammett’s last — and now confirmed — cases. Tomorrow: Before the Crime Spree. This entry was posted in Dash, Frisco, News and tagged Edwin Ware, Fresno California, Michael Fitzgerald, Modern Library Falcon, Pinkerton's, Stockton California, The Midget Bandit, Warren Harris, Wilmer Cook. Bookmark the permalink.